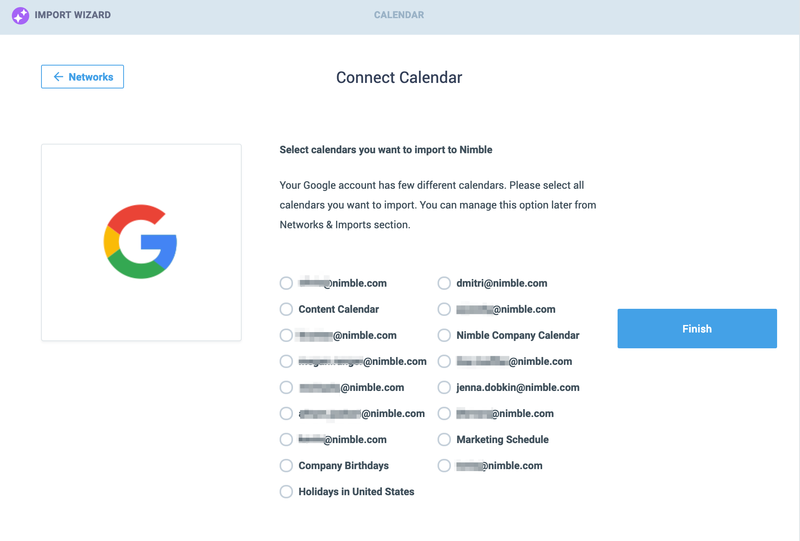 Nimble offers the ability to connect a Google and Office 365 calendar to your account to keep track of your meetings, birthdays and other special events. All events will sync to the Activities tab and to the Pending & History sub-tab of the related contact. Once the account is connected, Nimble will create a two-way sync for your events. Nimble also comes with its own built-in calendar. How do I connect my Google and Office365 calendar? To get started, visit Settings >> Networks & Imports and select "Calendars". An authorization window will pop up, and you'll then be able to select specific calendars to sync, as shown below. Once you connect your calendar, it will appear in your Nimble account under the Activities tab and in the Pending & History tab of the related contact record. What if I don't have a Google or Office365 calendar? 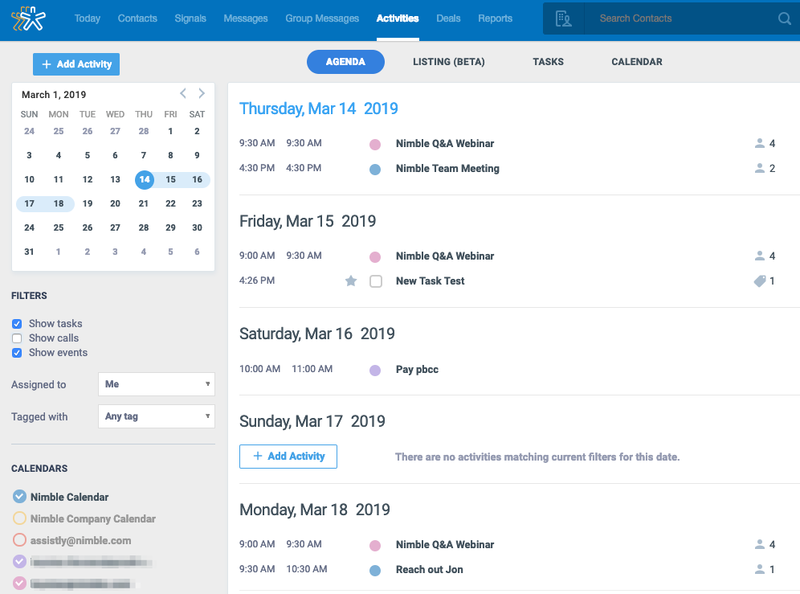 If you're not utilizing a Google or Office 365 calendar, you can still create and store events in Nimble related to your contacts by using the Nimble Calendar. Events can be created by going to the contact record and selecting "Add Activity" >> "Event". Or by going to the Activities tab and selecting "New Activities" >> "Event". 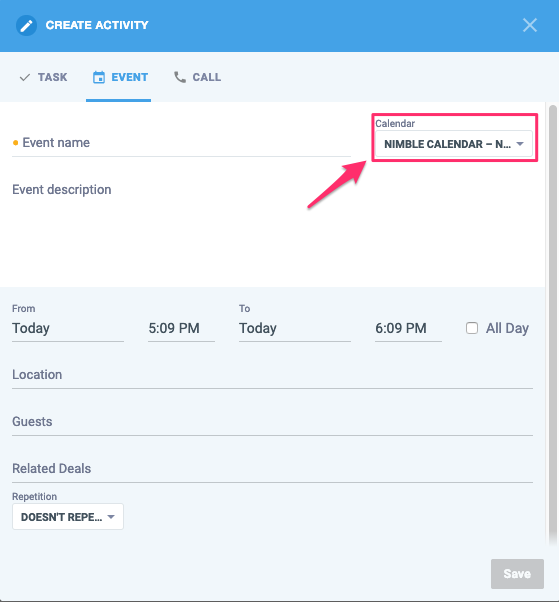 By adding the contact in the "Guest" field, Nimble will add the event to the contact record and display in the Pending & History sub-tab. Want to connect an alternative calendar to Nimble? Currently, Nimble only supports Office 365 and Google Calendar. If you are using Apple or another calendar, please let us know by writing to care@nimble.com and we'll share the feedback with our Product team for future updates!